It all started with the Samsung Galaxy S8 that launched with latest Qualcomm Snapdragon 835 chipset, followed by phones like the Mi6, Xperia XZ Premium, OnePlus 5, etc. Sony is a brand that keeps adding new stuff in its smartphones like a 4K display, a superb camera, etc. But, due to the bad pricing and the same design from past few years, the company has struggled to have its place among the companies like Samsung, LG, Huawei, Xiaomi, etc. It is being heard from a few weeks that Sony is going to launch two new phones with the model numbers Sony G8441 and G8341. 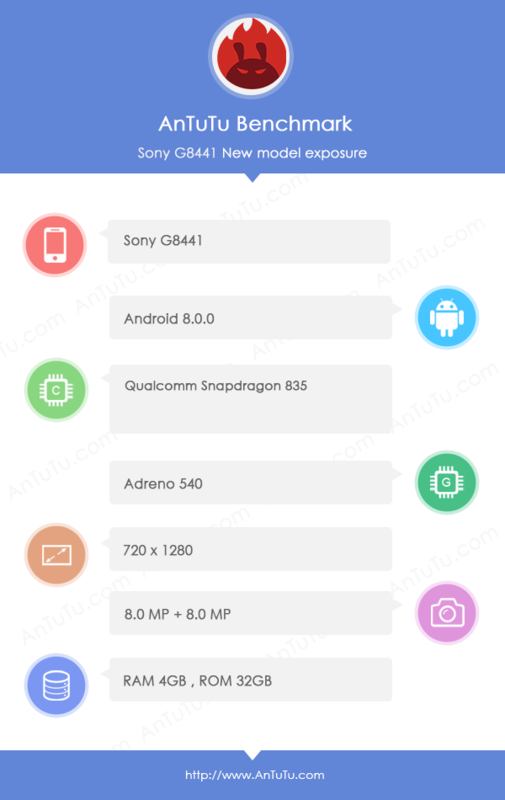 Today, the Sony G8441 was spotted on AnTuTu that revealed the major specifications of the device and these are quite surprising. Today, the Sony G8441 was spotted on AnTuTu that revealed the major specifications of the device and these are quite surprising. First of all, the phone is rocking the latest Snapdragon 835 processor along with the Adreno 540 GPU. But then, there is a 720p display so it might be a compact 5-inch smartphone from the company with high-end specifications. Also, the phone runs on the latest Android 8.0 out of the box which is quite interesting. Coming to the cameras, the phone has got a combination of 8MP rear and front cameras. There is 4GB RAM and 32GB storage (there will be a 64GB variant also). Well, it is quite an odd combination of a 720p display with the Snapdragon 835 processor. Let’s see what Sony has planned. The expected launch is at IFA 2017 which is between 1-6 Sep 2017. So, we still have a couple of months left. We hope to get some more information about the smartphones. Stay Tuned.